Power panels are the best answer for safe handling of power in applications such as power reception, distribution, with minimal or no use of use of control power. The power panel is made up of an enclosure which is properly designed for the size, air circulation, thermal management, lighting, mounting plate, rails, and various options for landing incoming power feed and delivering the distributed power. The enclosure is properly fitted with doors, inspection windows, painted, and grounded. Inside the panel, there are functional components such as measurement (CTs/ PTs etc. ), protection (fuses, MCCBs, OLRs, GFI etc. ), Isolation components (manual or automatic disconnects/ breakers), switching components (MCBs, MCCBs, VCBs, ACBs, switchgear, contactors. 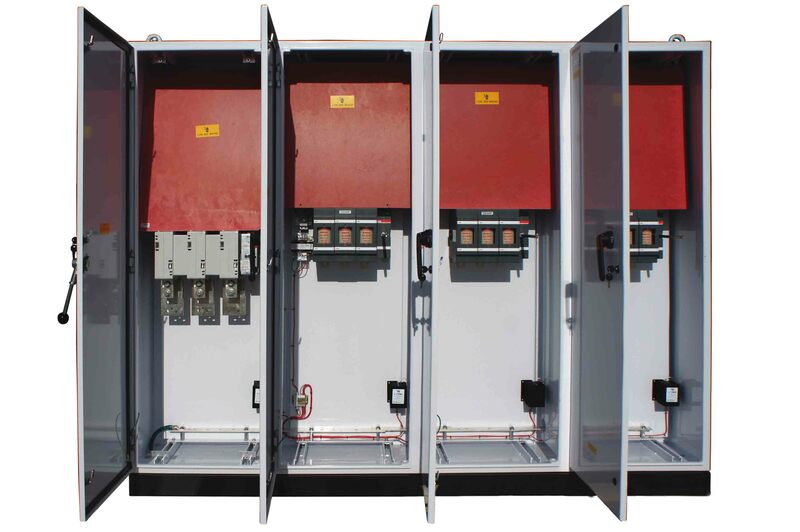 The panel designed based on operating voltage/ current, short circuit current, arc flash requirements, and the right type of busbars (Copper or Aluminum). The guiding principles of design follow applicable national, international, and regional regulatory standards such as CSA/ NEMA/ IEC etc. The enclosure specification would include mechanical, dimensional, environmental, thermal, painting, ingress protection, purging, ventilation, cable entry/ exit needs, mounting, handling, locking and indoor/ outdoor requirements. The electrical part of the specification would include, incoming power specs such as HV/ LV, three or four wire, sizing of conductors, insulation, main circuit breaker, short circuit protection, individual circuit fusing, thermal or magnetic or vacuum circuit breaker, isolation, single phase or three phase load descriptions, voltage and current needs, operating needs such as status indication, grounding needs, breaker short circuit ratings, etc. There are available in 30amps to 1600amps and up to . . . . This distribution panel is rated for 2000 A current and . . . . Solution Control Systems have the proper approvals to manufacture service . . . . Transfer switches are manufactured in two types: automatic or manual. . . . .